Want to know about the nightlife in Siem Reap? There are so many tourists and backpackers in Siem Reap. All over town, they've set up bars targeted at foreigners. You find most bars in Pub Street and they're open until midnight. But some bars close after the last guest! Pub Street might remind you of Khao San Road in Bangkok. You can hear loud music when you enter the area, and it's hard to know exactly where the music comes from. Tuk-Tuk drivers guard each end of Pub street, and are ready to ask if you need a lift! Happy Hours can be found anywhere and every day, and it's the best way to save money on drinking! When I last visited Siem Reap in April 2010, the hot bar in Pub Street was Angkor What? Bar. Around midnight, it was already full! What drew my attention was the music they were playing, and the contagious atmosphere! They play old and new rock, alternative music and the beers are pouring in! Buckets have entered Siem Reap's drinking zone, and cost between $4-10. The Long Island bucket ($10) is the most expensive one, and it's fun to share drinks with fellow travelers! If liquor is not your favorite, grab a pint of Angkor beer for $0.75. Feeling like dancing and drinking all night? You might like Temple Bar on Pub street. It gets pretty packed here after 22.00, so if you want seats you should come as early as possible. For hang-out spots and cheap beer, you might try The Warehouse where you'll find the relaxed expats playing pool or fusball while listening to classical rock. If you're up for a cozier bar, you should head for Fresh Chilli Si-Dang which is tucked away from the noisy Pub street. Here you'll get nice cocktails and fine Khmer cuisine. I went to the trendy and funky Laundry Bar. With a vast music library, travelers and expats hang out here to enjoy the music and the really good cocktails. It's a good place to chill after visiting the Angkor temples. 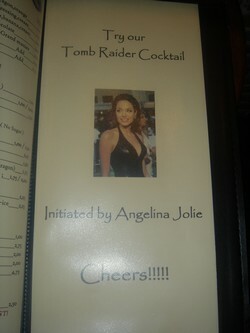 If you're a fan of Angelina Jolie and want to try the famous Angelina cocktails, go here! Red Piano is a laid-back restaurant/bar where you can have your dinner in their nice small garden/sidewalk. I chose a pasta dish when I ate here once. Inside, you'll be met by red decor, bright yellow lighting and candles. Many tourists, few backpackers. Red Piano is a good choice if you just want to relax with some drinks and escape the wild parties! If you can't afford drinking on bars, you can always buy beer at the local supermarkets in Siem Reap! If you don't want to buy many cigarettes at the time, you can get one pack for $1.20 (Marlboro red and light). Siem Reap restaurants - yummy!